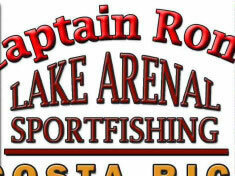 Captain Ron's Lake Arenal Fishing Tours -- the premier fishing guide service on Lake Arenal. Your adventure starts the moment you launch with Captain Ron. Experience the thrill of catching a guapote or machaca when you fish Lake Arenal, a sparkling 33-mile lake located in the north-central highlands of Costa Rica. Lake Arenal is next to the very active Arenal Volcano, one of Costa Rica's most popular destinations. The Lake Arenal and La Fortuna area is a convenient hub for many adventure tours, and features hot springs, zip lines, kayaking, white-water rafting, and other exciting excursions. 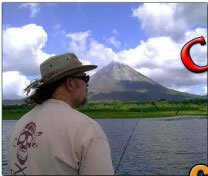 Fishing Lake Arenal is an experience of a lifetime for the serious angler or novice. Lake Arenal is world-famous for a spectacular fish called the rainbow bass, or guapote, in Spanish. Lake Arenal also has another hard-fighting fish called machaca, which looks like a pirhana on steroids with its rows of razor sharp teeth. With Captain Ron's Lake Arenal Fishing Tours, you fish at the base of Arenal Volcano, close enough to see and hear lava and boulders roll down the mountain. Most days the volcano has small eruptions of ash and steam that makes this a memorable fishing trip. Your guide, Ron Saunders, is a seasoned American fisherman with top quality gear for conventional, spin, or fly fishing. Third or fourth person: $70 per person extra half or full-day. We can accommodate up to four adults for fishing, but only three may fish at a time. Special accommodations for children – call for rates. Pick-up and drop-off at the Marina de Repressa (near La Fortuna), at La Mansion Hotel, at Los Heroes Hotel, or Nuevo Arenal Park. Recommended items to bring: light rain jacket, sunscreen, hat, sunglasses. Tours are conducted rain or shine. In the rare occasion it may be necessary, Capt. Ron reserves the right to delay or reschedule if weather conditions are dangerous. Call or email us for more detailed information and departure times. Rain Forest Tours offers packages for fishing and evening lava tours, as well as taxi service for pick-up and drop off, and lava tours with gourmet meals. 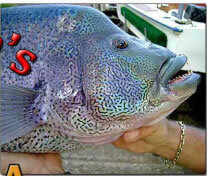 We can arrange for packages at local hotels to include your fishing trip and meals. Just let us know!